The two Foscari of the title in Verdi’s opera I due Foscari are father and son. Francesco, the father, is Doge of Venice; Jacopo, the son is awaiting trial in prison. As Doge, Francesco must uphold Venetian justice impartially and publically, but in private he is distraught at the fate of his unjustly accused son. This is the basis for the powerful duet that concludes Act I, in which Lucrezia, Jacopo’s wife, demands that Francesco help his son, and is unable to understand the father's apparent cruelty and distance. It is a great scene, with two clear characterizations. Displaying steadfastness under duress is a characteristic of the Doge in this opera, and thus in his music. The Doge's situation require the exercise of restraint, especially when faced with the unrestrained responses of his son and daughter-in-law. In this duet, Lucrezia sings an impassioned section in C minor ‘Tu pur lo sai…’ ('You know it well…') where her vocal lines grow more accented, dramatic and higher in pitch as she continues, in an unmistakable expression of her fervour. Her unaccompanied concluding cadenza features much repetition of the word ‘barbaro’ (cruel), making her view of Francesco completely clear. Francesco’s reply, in the key of C major, contrasts with Lucrezia’s C minor. His phrases are more evenly pitched at the start, and the decorations of line more lyrical than explosive. He is trying to calm and placate her, while at the same time revealing his own suffering as a father. Rather than insult him, he argues, she should weep with him. This is the personal Francesco, not the public politician. Both voices sing together at the end, still in C major – Francesco has had some musical effect on Lucrezia at least. In the final shared cadenza she sings again ‘cruel father’, while he declares his wish that his son may once more be free. On its own this is great stuff. But 'Tu pur lo sai' is just the second part of the whole concluding duet – an entire scene with several sections. It is a good example of a recurring idea in 19th-century Italian opera sometimes referred to as ‘la solita forma’ – the usual form (a phrase first used by Abramo Basevi, a 19th-century writer on Verdi’s music). But the point of it is not some formula, not least as there are so many more variants to be found than model ones, this example included. Rather, it is a way of seeing how a scene can be made more intense through the use of the music. The first section (Basevi’s ‘tempo di attacca’) launches the action boldly. Often someone arrives or a dramatic announcement is made: in this example, Lucrezia enters, determined and angry, ready to confront the Doge. The music combines recitative with agitated, explosive orchestral interjections that convey Lucrezia’s passion. The second section, 'Tu pur lo sai', is the ‘adagio’, a slow reflection on the feelings of the two characters, giving the audience time to consider the implications of what is happening. The third, short section is a slightly faster but still measured, and marks another interjection of news or a different point of view – here, where Lucrezia admits she believes Francesco is not a heartless father. The final section is the ‘Cabaletta’, fast and energetic, usually with a call to action or a sense of determination: here Verdi uses several short sections run together. Lucrezia plays hard on Francesco’s emotions – to act as a father, not a doge – and he with equal firmness declares he is deeply moved but powerless to act. With each challenge and counter-challenge the music adapts rhythm and key to build dramatic tension. In Verdi's hands, this type of construction of a whole scene is brilliantly compelling, as the audience are introduced to the characters, presented with their opposition and drawn in as the situation gets more fraught and the music faster and bolder. It is hardly a surprise that such scenes invariably end with the same result: resounding and emotion-filled applause! The production is a co-production with Los Angeles Opera, Palau de les Arts Reina Sofía, Valencia, and Theater an der Wien, and is given at the Royal Opera House with generous philanthropic support from Mrs Aline Foriel-Destezet, Mrs Susan A. Olde OBE, Colm and Ella Kelleher and Mrs Philip Kan. Thank you for this wonderful analysis. 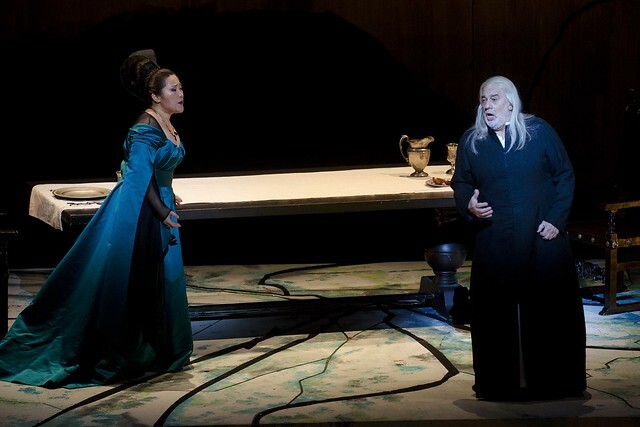 I love this opera very much and learned a lot from this article. Why is the audio file not available in Malta? The audio file is not available in Malta because it uses Spotify, who have not launched there yet so this would be a question for them.